We live in a pretty small house. Not tiny house movement small, but still small, especially when it’s shared by six people. 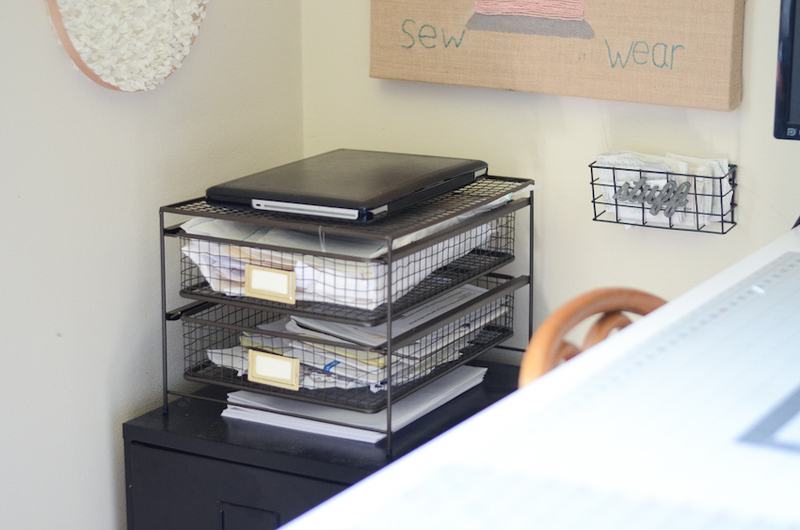 As our family has grown, my sewing room has moved around – the basement, the office… currently, I’m sewing in part of our bedroom. 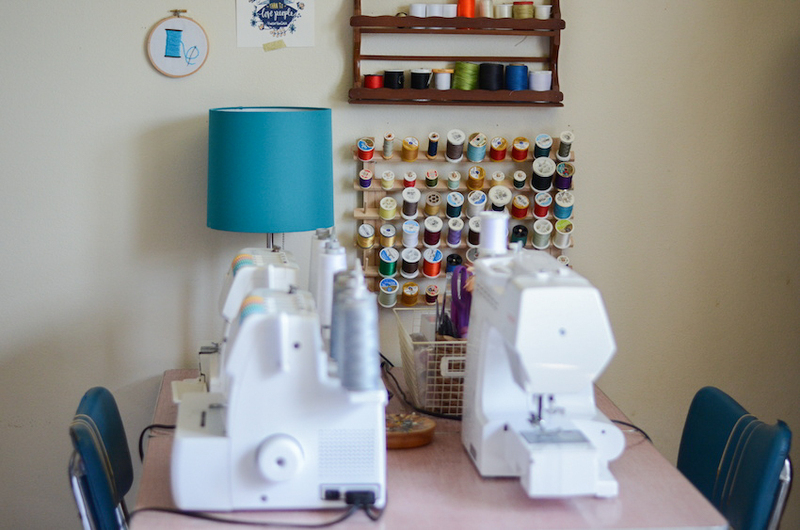 Sewing in a small space can be a challenge, but it’s still possible to have an inspiring place to create. 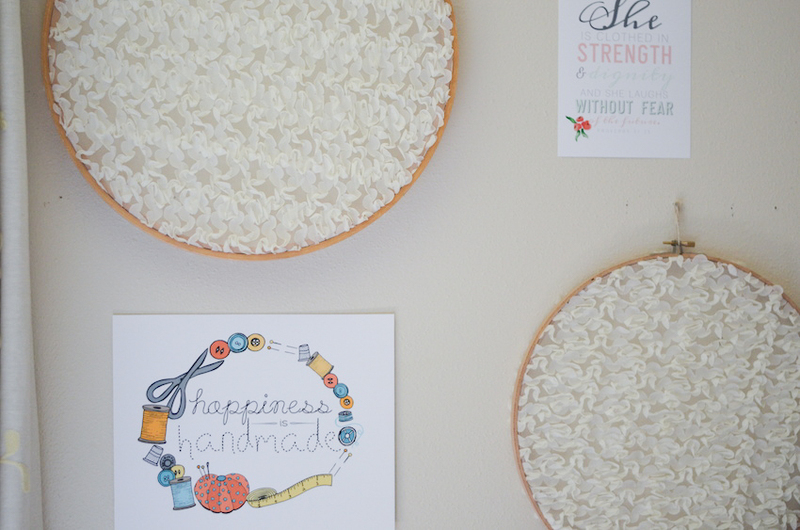 Sit back and take a little tour of my sewing room! 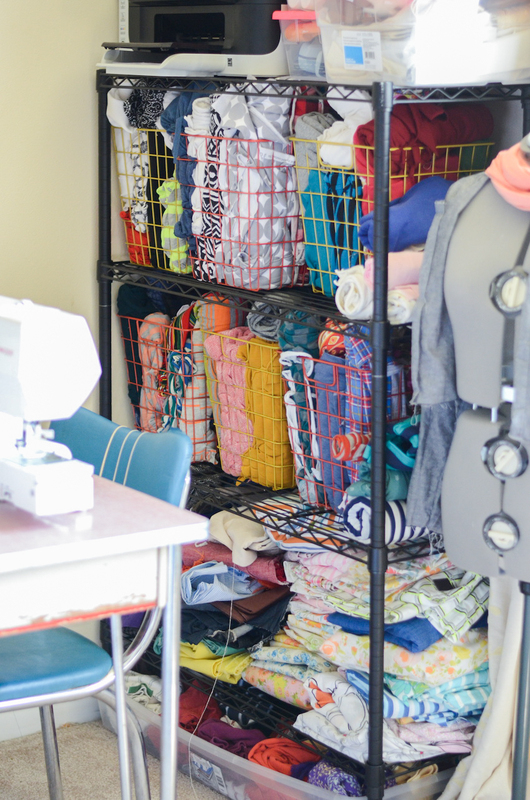 When you sew in a shared space, you probably don’t have a lot of room to spread out. 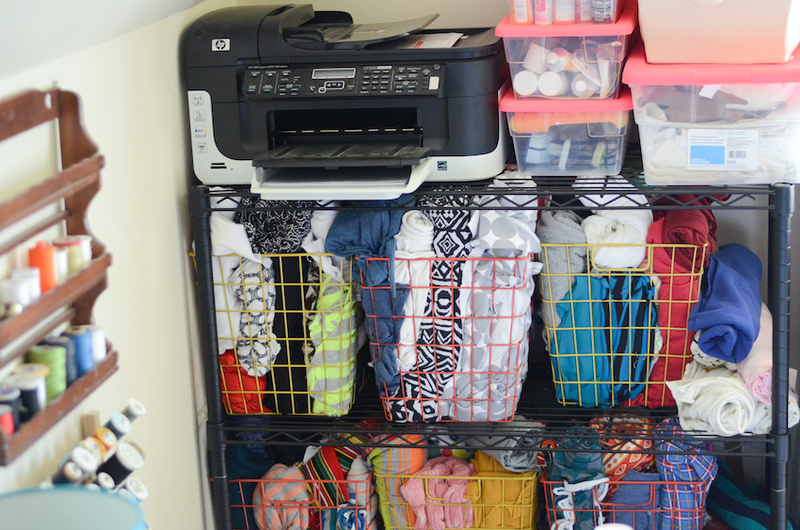 You need to be efficient with your storage and your usable space. It also means keeping your space a lot cleaner than you would if you could just close the door at the end of the night. 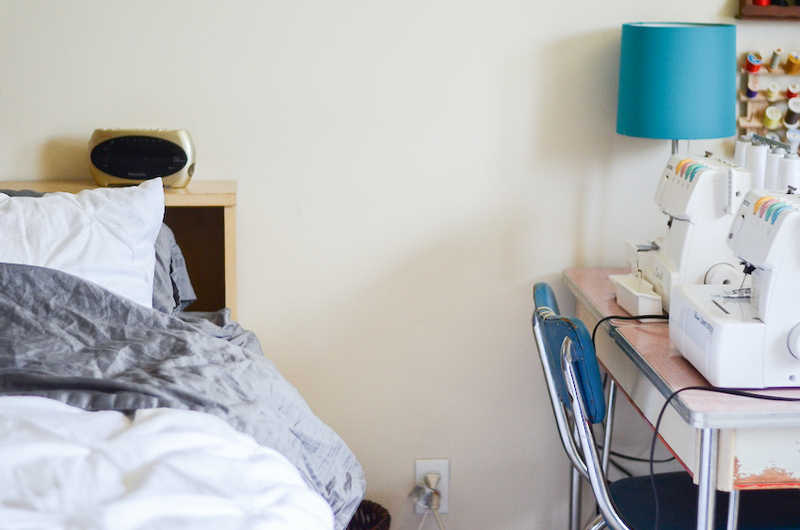 But when you sew right next to your bed, you’ve got to keep things at least a little bit organized! I have enough room for two tables. 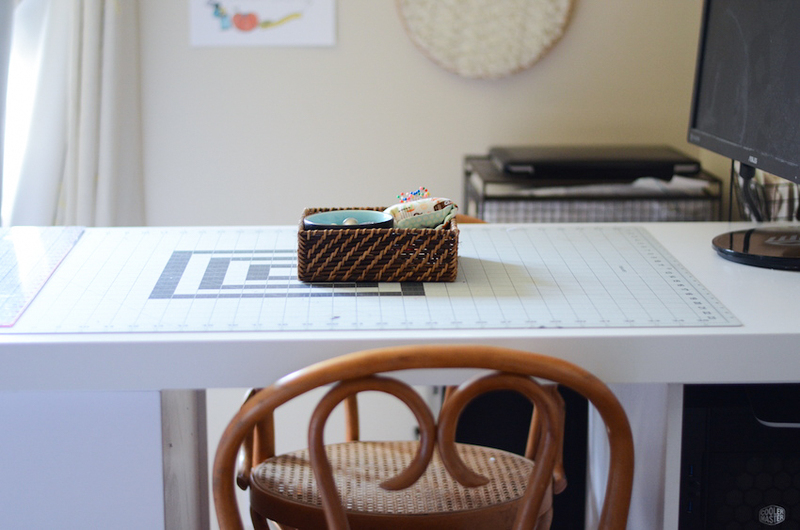 I have a low table where I keep my serger, coverstitch, and sewing machine. I also have a counter-height cutting table. Since I’m not a quilter, I find that I usually have plenty of space on the table, even with all three machines. I can easily shift one over a bit if I need to. I can also quickly switch from serger to coverstitch when sewing with knits, which I find super convenient. Small spaces don’t have to lack personality. Since this one little corner of the house is just mine, I wanted to feel good every time I’m here. 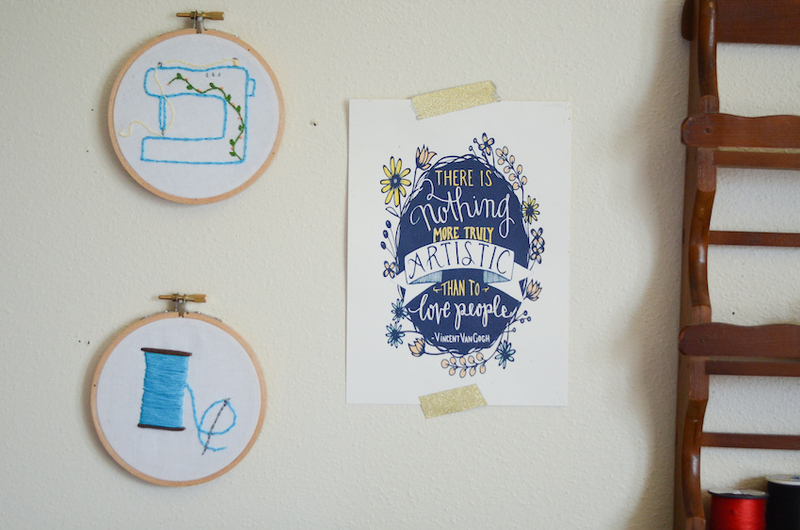 These sweet hoops are from my friend Alyson, and the print is from Mandy England (whose shop appears to be closed now). 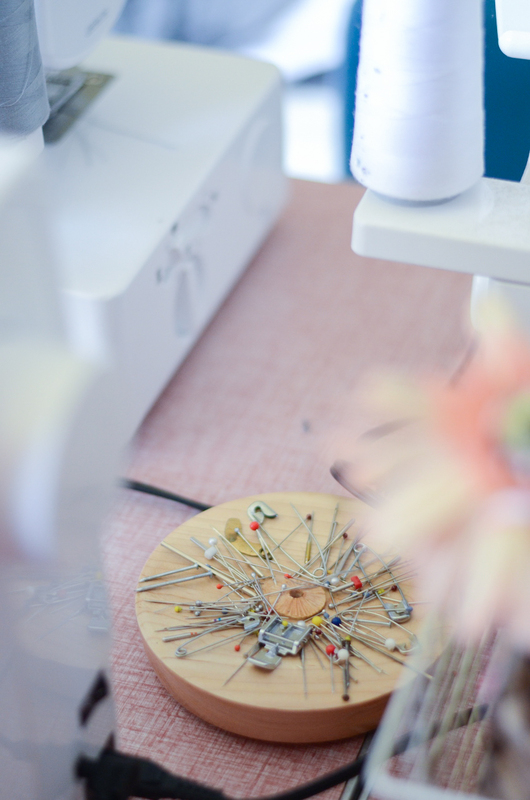 On the table, I keep things I don’t like to get up to find when I’m sewing: seam ripper, bobbins, scissors, tweezers, button-hole foot, tube turner, etc. 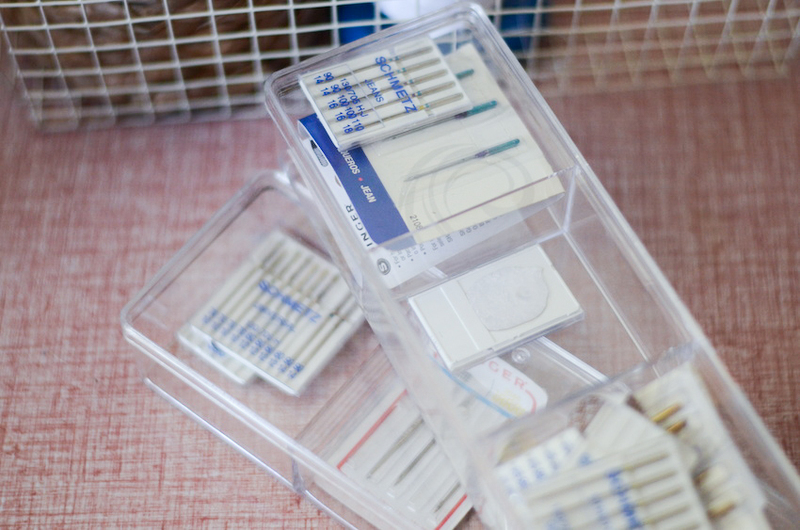 I recently found these divided containers in the Target Dollar Spot, and they’re perfect for organizing my needles. I keep them in the basket, too. I picked up a handmade, magnetic pin holder at a local quilt museum, and it’s become one of my absolute favorite tools. I keep my zipper foot on here too, so that I can grab it easily. 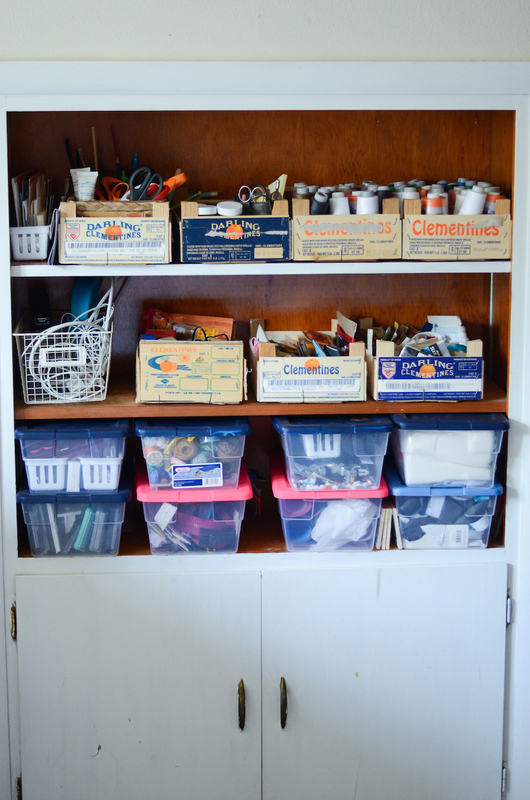 When it comes to why I organize the way I do in this space, many decisions are kid-driven. For example, when you have a two-year-old who loves to turn on and off the printer all the time, moving it to the top shelf just makes sense. I try to keep most of my sharp things up high, as well as markers and paint. Because toddlers. 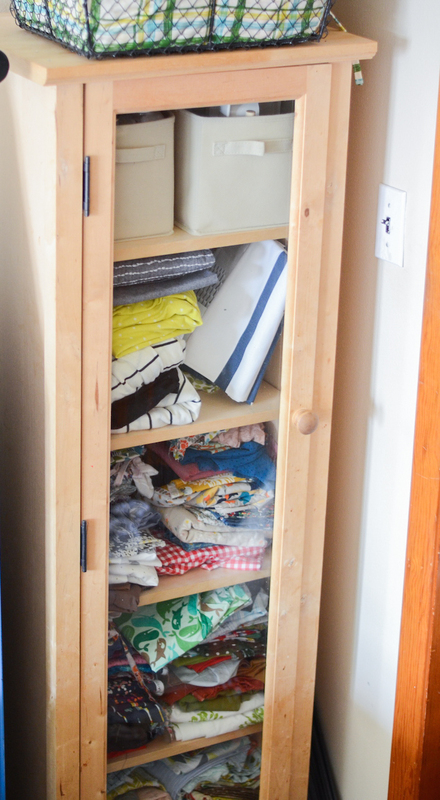 I also have a small cabinet where I keep the rest of my woven fabrics. 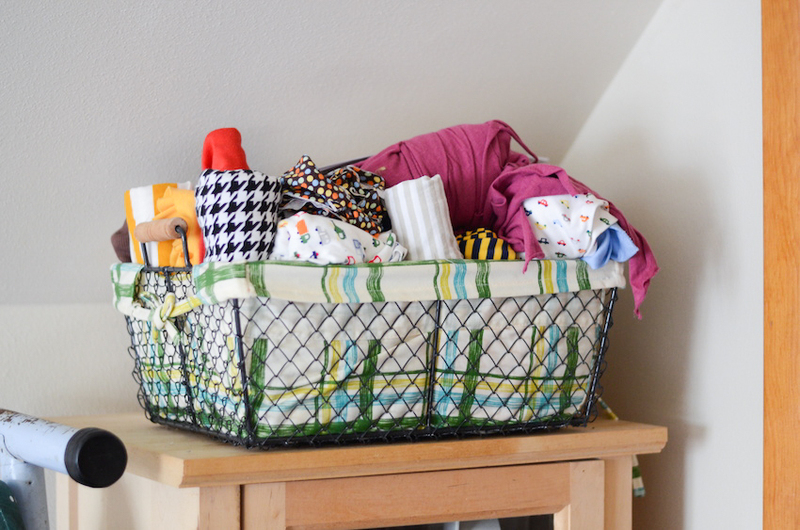 I recently went through all my fabric and took out a lot of things that I just didn’t love anymore. It gave me a lot more space for the fabric that I do love, and I can find what I need much more easily now. 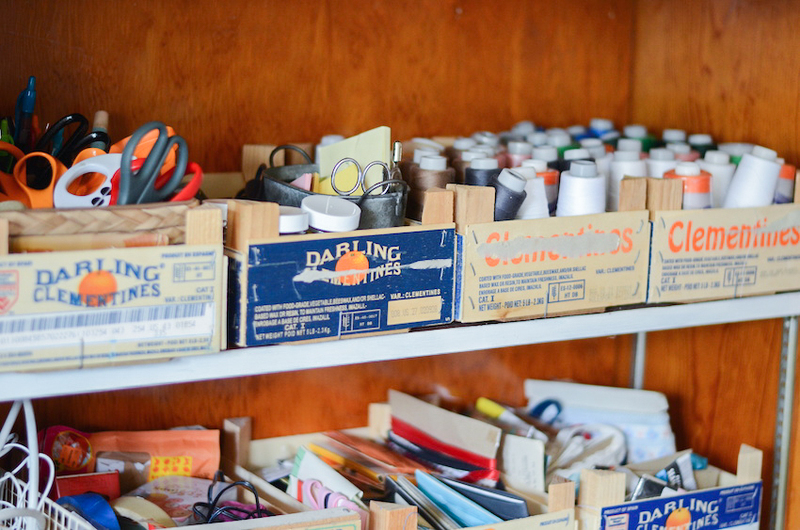 I also keep some more not-kid-friendly craft or office supplies in this cabinet. Like fabric markers. Because seriously… toddlers. On top I have a basket of knit scraps. I got rid of a ridiculous amount of scraps, because they just kept piling up. These are all good sized scraps, and most of them could make a toddler tee or baby pants. On the wall across from the bed, we have these built-ins. I keep most of my other supplies here. Bias tape, piping, hardware, extra scissors, cone thread spools, elastic, zippers, snaps, etc. 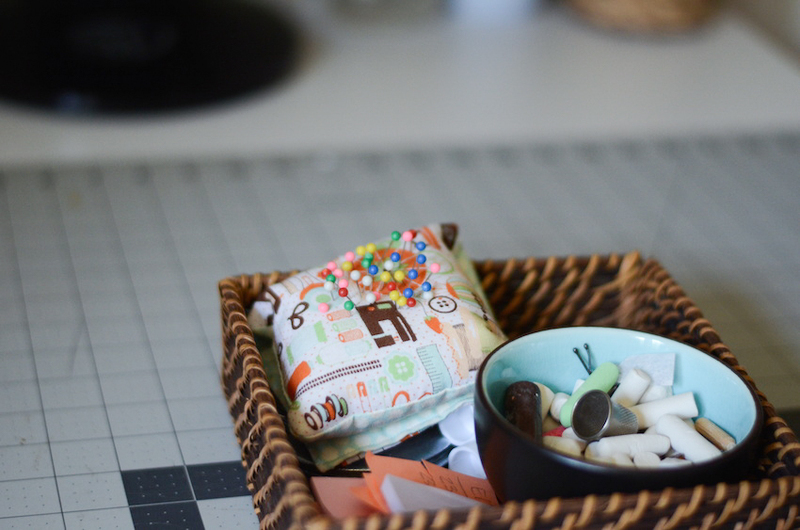 I’ve been storing things in these Clementine boxes for years, and I have found a way to incorporate them in every sewing space I’ve had. The contents of the boxes change occasionally, but I’m not sure I’ll ever give them up. Across from my sewing machines, I have my cutting table. This is a recent purchase, and I l.o.v.e. it. My three-year-old pretty much built it on his own (seriously), so it’s incredibly easy to put together. It’s sturdy and has all these great cubbies. I’m not kidding when I tell you that I really do love this table!! Usually this table is pretty well covered with a project of some sort. Or something I’m hiding from the kids. Just out of the picture are the tools I use: rotary cutters, Gingher shears, rulers, pens, tape, etc. Because of the limited space in our house, we don’t have an office. So the computer sits on the end of the cutting table. It actually works really well, because if I need to look at pattern instructions or if I just want to watch something on Netflix, I can pull it right up. But it’s also easy enough to move, should I need the extra space. You can find a tutorial for the wall art here. My sweet sister-in-law gave me these hoops that were used as decorations at her wedding. I love them just as they are, so they were an easy addition to my space! The fabulous prints are from Mercy Ink (top right) and Pen and Paint. 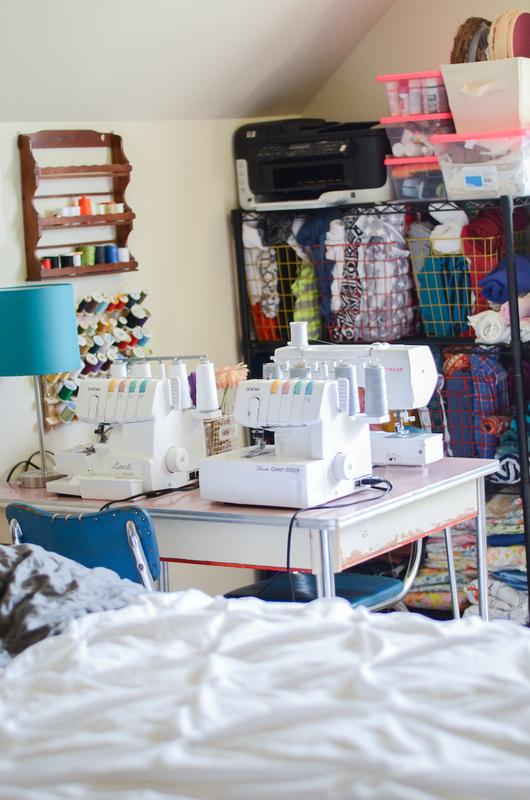 Having my sewing space in the bedroom can sometimes be a challenge – if I relaxing in our room, I do have moments where I get distracted by all the projects I could be working on. It also makes late night sewing tricky, if my husband wants to go to sleep. 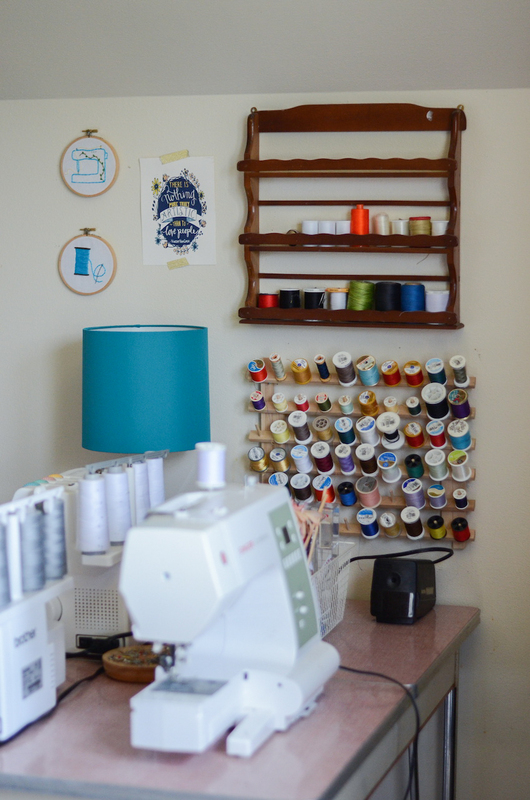 No, it’s not perfect, and while I certainly would love to have my own sewing room again, I’m so happy with the space I’ve created! 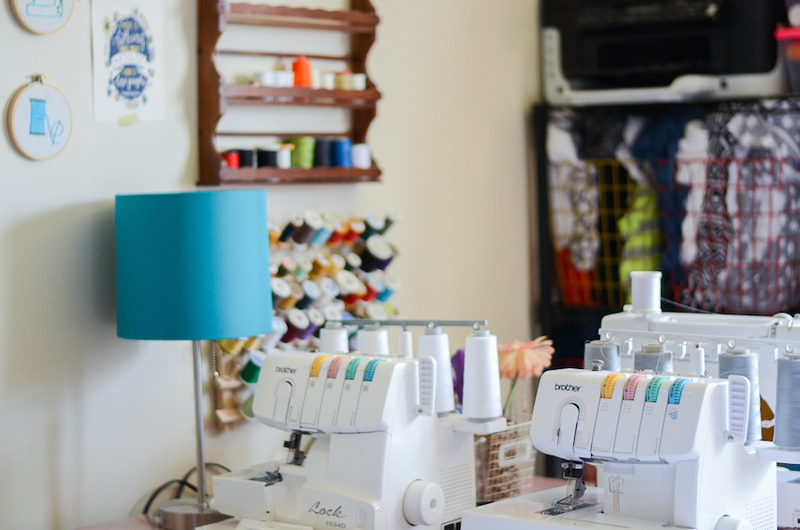 It’s easy to assume that everyone else has a gorgeous sewing studio, or to see beautiful sewing rooms on Pinterest and get frustrated with your limited space. 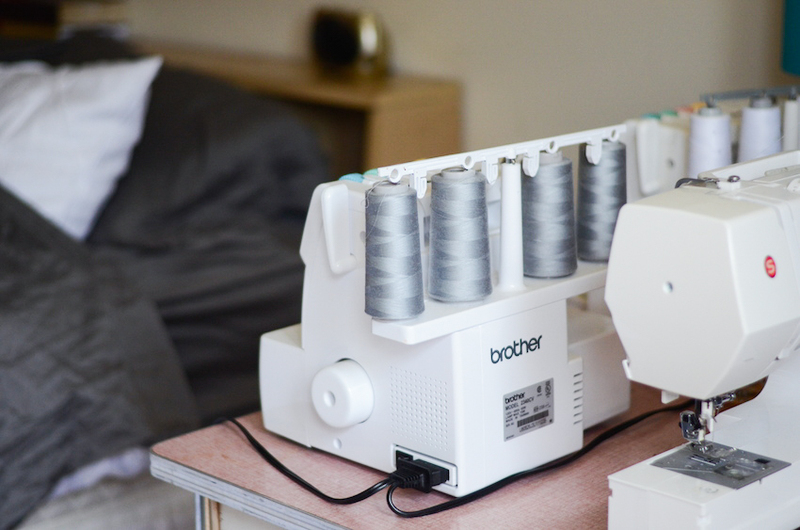 But wherever you sew – on your kitchen table, in a corner of the basement, or anywhere in between – that space becomes yours once you sit down at that machine. In this season of my life, in my house that often feels too small, I’m choosing to be grateful for the space that I do have. For a husband who doesn’t mind that I set up shop in our bedroom. For kids who are thankful and excited for handmade clothes. For a fabric stash that certainly isn’t wanting. Wow! Beautiful space. Thanks for sharing! You have given me ideas. Love it! I’m looking for ideas since I’ll be condensing my craft space and office space into the bedroom… Plus I have that book on hold at the library. Now I can’t wait to get it! I sew in the bedroom too! I am lucky to have almost an entire hallway closet to store my stash. I’ve seen this book mentioned a few times, I think I need to look into it! I sew in the bedroom too! I am lucky that I have almost an entire hallway closet to store my stash. I’ve seen this book mentioned before, I need to look into it! I love this article – the pictures and the tone of it. You are eight, it’s so easy to be discontent with our sewing space, but wherever you sew, there isuch to appreciate! 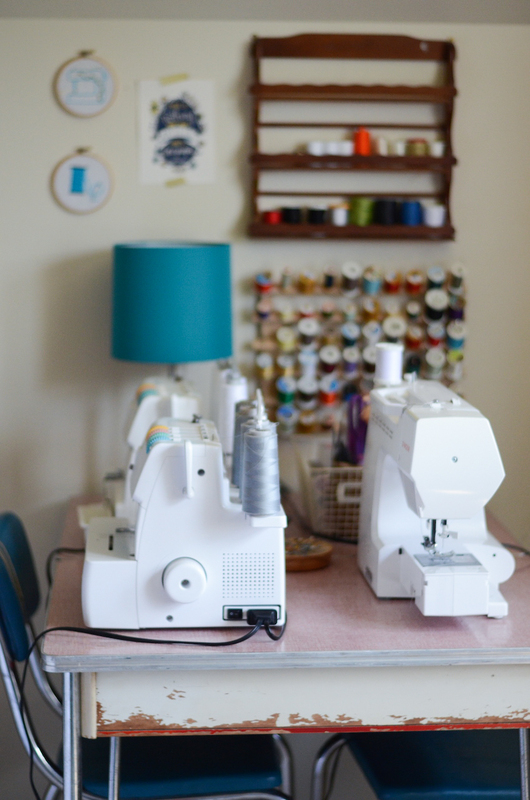 I’m still at the dining room table with stuff stored in the basement, but I am still hoping to get a permanent sewing area set up in the launry room before homeschool starts again. Nothing much besides the light from the window YET. 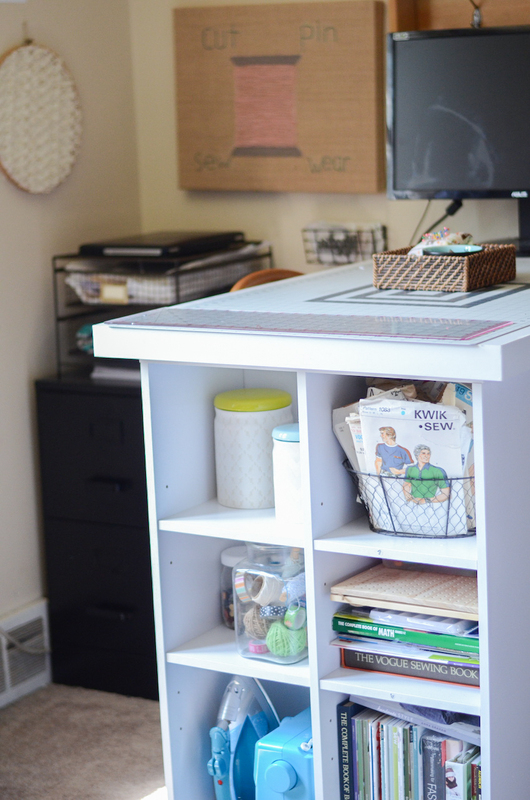 I just “built” a bar height desk, to work on so I am not sewing on the floor anymore, and hope to spiff up the tiny corner of my room to work in. Love this post! You’ve done a masterful job with your space. 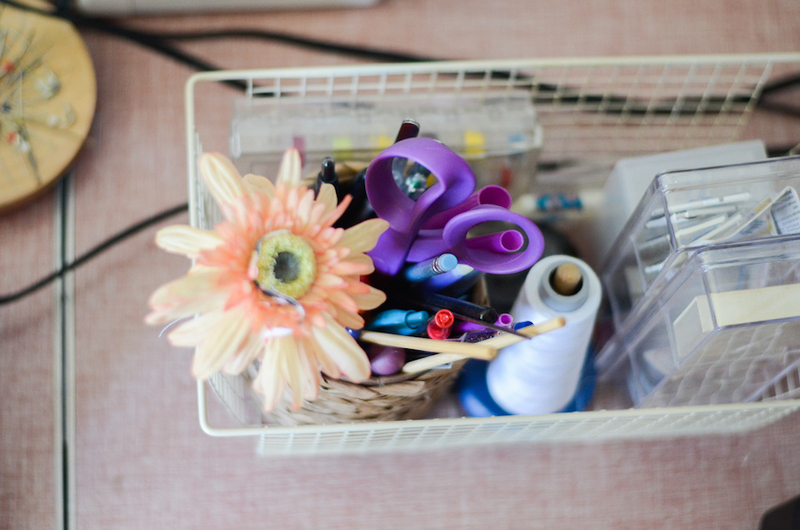 It is so fun to see how other creative souls organize and manage their spaces. Thanks for sharing! I Looove your blog name!!! I have a 2 and 3 year old and it is the cry of my heart! If only they would nap! Ha! I just started sewing and was deteone to to let lack of space keep me from trying but I don’t have a dedicated room so I’m using the front entry closet for storage and am usually backing that with a folding table so I can use the light from the dining area picture window. Thanks for sharing your tips they are super helpful! Ha! My front entry idea didn’t work so now I’m in the living room and just realized I love this post so much I commented again! #sigh it’s just such a darned good post, thx!